In an effort to be recession-era chic, both members of JSG recently and separately tested out the Vamoose bus service from New York to Rosslyn, VA (across the bridge from Georgetown). While the price is right: $25 one way, compared to $72 for the cheapest Amtrak train, the experience left a lot to be desired. 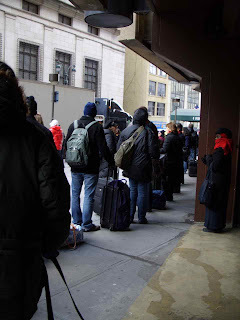 I got to the bus stop 15 minutes in advance of my 2 pm Friday reservation to find a line so long I asked if there were two buses for all of us. Negative. Not helping matters, it was 20-something degrees outside and windy. Note to self: Only take the bus in decent weather. By the time I got on, the only seats were in the back. Fortunately, I did score a window seat, which is probably the only thing that saved me from having a full blown panic attack on the ride. The seats are close together and when you’re sitting in the back, you can’t see anything through the front window. Not good for the claustrophobics amongst us. On top of this, in these cramped quarters, you either have to store your bag above or put it on the floor, which is not the place I like most of my bags to touch. Fortunately, I had my patent LAMB bag, which is easy to clean. Even still, every time I wanted to get something, I had to inconvenience my seatmate. Between that and my work-related phone calls, she was shooting daggers at me. Making matters worse, my cost savings over the train was reduced by $20 as I was originally booked on a non-refundable ticket on Bolt Bus, which apparently flls up fast and doesn’t offer refunds or let you reschedule tickets. (Bolt is the line our friends Julia All About The Pretty and Tamar Fashion Binge recommend for its free internet service, though Julia reports the seats are also pretty tight.) I paid $50 total between the two tickets instead of $70 for the train. I took Amtrak home. My experience was much more positive. I was headed to NYC over the holidays with my mother and two daughters. Our trip was last minute, so plane tickets were definitely out of the question and Amtrak rates weren’t much better. To NY was a breeze, my dad dropped us off in Rosslyn, we immediately climbed onto the bus and found great seats, which weren’t claustrophobic at all. The bus filled up and we left within 20 minutes. We stopped once at a rest area and landed at Penn Station 4 1/2 hours later. The ride home was a little more tedious. We had to wait in line for half an hour and there was traffic leaving the city. Fortunately, our driver made up serious time on the highway and again we were home in good time. We paid $175 for the four of us roundtrip (we earned one free ride from the four tickets we bought on the way North), a savings of about $400, which we duly used for tea at the American Girl store, lunch at the Plaza, and some cheap plastic stuff at the M&M store. The train is more comfortable and keeps you blissfully out of traffic; but the bus served us well on this trip.